Researchers report important new insights into evolution following a study of mitochondrial DNA from about 5 million specimens covering about 100,000 animal species. In genetic diversity terms, Earth's 7.6 billion humans are anything but special in the animal kingdom. The tiny average genetic difference in mitochondrial sequences between any two individual people on the planet is about the same as the average genetic difference between a pair of the world's house sparrows, pigeons or robins. The typical difference within a species, including humans, is 0.1% or 1 in 1,000 of the "letters" that make up a DNA sequence. Genetic variation – the average difference in mitochondria DNA between two individuals of the same species – does not increase with population size. Because evolution is relentless, however, the lack of genetic variation offers insights into the timing of a species' emergence and its maintenance. The mass of evidence supports the hypothesis that most species, be it a bird or a moth or a fish, like modern humans, arose recently and have not had time to develop a lot of genetic diversity. The 0.1% average genetic diversity within humanity today corresponds to the divergence of modern humans as a distinct species about 100,000 – 200,000 years ago – not very long in evolutionary terms. The same is likely true of over 90% of species on Earth today. Genetically the world "is not a blurry place." Each species has its own specific mitochondrial sequence and other members of the same species are identical or tightly similar. The research shows that species are "islands in sequence space" with few intermediate "stepping stones" surviving the evolutionary process. The new study, "Why should mitochondria define species?" relies largely on the accumulation of more than 5 million mitochondrial barcodes from more than 100,000 animal species, assembled by scientists worldwide over the past 15 years in the open access GenBank database maintained by the US National Center for Biotechnology Information. The researchers have made novel use of the collection to examine the range of genetic differences within animal species ranging from bumblebees to birds and reveal surprisingly minute genetic variation within most animal species, and very clear genetic distinction between a given species and all others. "If a Martian landed on Earth and met a flock of pigeons and a crowd of humans, one would not seem more diverse than the other according to the basic measure of mitochondrial DNA," says Jesse Ausubel, Director of the Program for the Human Environment at The Rockefeller University, where the research was led by Senior Research Associate Mark Stoeckle and Research Associate David Thaler of the University of Basel, Switzerland. "At a time when humans place so much emphasis on individual and group differences, maybe we should spend more time on the ways in which we resemble one another and the rest of the animal kingdom." Says Dr. Stoeckle: "Culture, life experience and other things can make people very different but in terms of basic biology, we're like the birds." "By determining the genetic variety within species of the animal kingdom, made possible only recently by the burgeoning number of DNA sequences, we've documented the absence of human exceptionalism." Says. Dr. Thaler: "Our approach combines DNA barcodes, which are broad but not deep, from the entire animal kingdom with more detailed sequence information available for the entire mitochondrial genome of modern humans and a few other species. We analyzed DNA barcode sequences from thousands of modern humans in the same way as those from other animal species." "One might have thought that, due to their high population numbers and wide geographic distribution, humans might have led to greater genetic diversity than other animal species," he adds. "At least for mitochondrial DNA, humans turn out to be low to average in genetic diversity." "Experts have interpreted low genetic variation among living humans as a result of our recent expansion from a small population in which a sequence from one mother became the ancestor for all modern human mitochondrial sequences," says Dr. Thaler. "Our paper strengthens the argument that the low variation in the mitochondrial DNA of modern humans also explains the similar low variation found in over 90% of living animal species – we all likely originated by similar processes and most animal species are likely young." 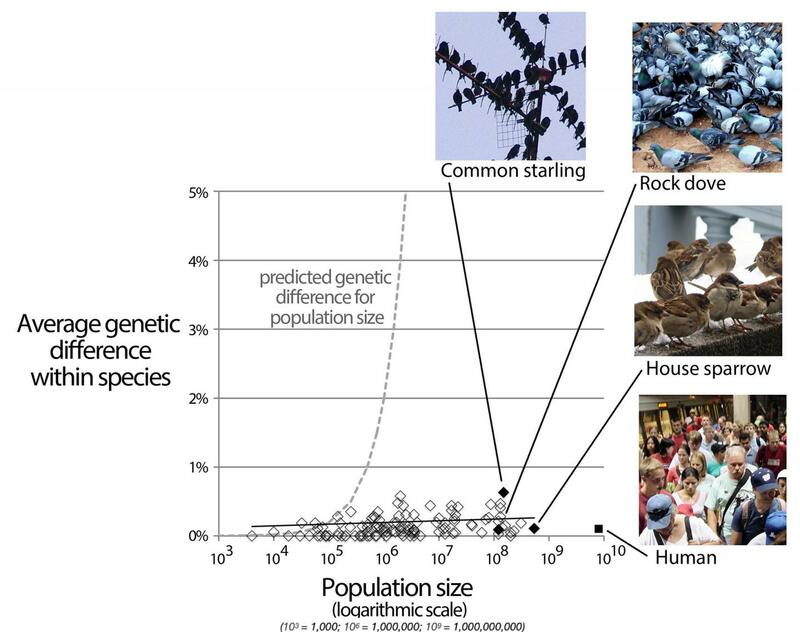 The study results represent a surprise given predictions found in textbooks, and based on mathematical models of evolution, that the bigger the population of a species, the greater the genetic variation one expects to find. "Is genetic diversity related to the size of the population?" asks Dr. Stoeckle. "The answer is no. The mitochondrial diversity within 7.6 billion humans or 500 million house sparrows or 100,000 sandpipers from around the world is about the same." The paper notes, however, that evolution is relentless, that species are always changing, and, therefore, the degree of variation within a given species offers a clue into how long ago it emerged distinctly — in other words, the older the species the greater the average genetic variation between its members. While asteroids and ice ages have played major roles in evolutionary history, scientists speculate that another great driver may have been the microbial world, notably viruses, which periodically cull populations, leaving behind only those able to survive the deadly challenge. "Life is fragile, susceptible to reductions in population from ice ages and other forms of environmental change, infections, predation, competition from other species and for limited resources, and interactions among these forces," says Dr. Thaler. Adds Dr. Thaler, "The similar sequence variation in many species suggests that all of animal life experiences pulses of growth and stasis or near extinction on similar time scales." "Scholars have previously argued that 99% of all animal species that ever lived are now extinct. Our work suggests that most species of animals alive today are like humans, descendants of ancestors who emerged from small populations possibly with near-extinction events within the last few hundred thousand years." Another intriguing insight from the study, says Mr. Ausubel, is that "genetically, the world is not a blurry place. It is hard to find 'intermediates' – the evolutionary stepping stones between species. The intermediates disappear." Dr. Thaler notes: "Darwin struggled to understand the absence of intermediates and his questions remain fruitful." "The research is a new way to show that species are 'islands in sequence space.' Each species has its own narrow, very specific consensus sequence, just as our phone system has short, unique numeric codes to tell cities and countries apart." Adds Dr. Thaler: "If individuals are stars, then species are galaxies. They are compact clusters in the vastness of empty sequence space." The researchers say that with the bones or teeth of an ancient hominid, like those found in southern France or northern Spain, scientists might shed further light on the rate of evolution of the human species. "It would be very exciting if over the next few years physical anthropologists and others were able to compare mitochondrial DNA from hominid species over the last 500,000 years," says Dr. Stoeckle. The work was carried out in part through the Marine Science and Policy Initiative of the Program for the Human Environment (The Rockefeller University) and the Urban Coast Institute (Monmouth University).